All items are subject to prior sale. If sending a check, or money order, it is advisable to contact us first to request that the book be reserved for you pending receipt of payment. 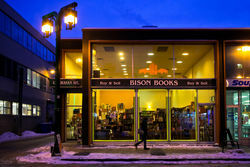 Any item purchased from Bison Books is returnable, postpaid, within ten days of receipt if it is found to be different than as described. GST will be charged on all Canadian orders. Actual postage costs, if greater than quoted, due to extra weight or size, will be quoted to you by email upon receiving your order or inquiry.